The City Hall gallery is an open space in the main lobby and hallway leading to City Council Chambers. Around the open gallery space are city office reception desks that are frequented by the public and city personnel. The gallery has professional Arakawa hanging system, gallery lighting, as well as ample natural light filtering in through tinted glass walls and atrium ceiling. Exhibits are 4 to 5-week and can be individual or group shows with the space accommodating approximately 20-30 artworks total. Hours of operation: 8am - 5pm, Monday - Friday. Cheryl Sallee Gallery Wall at the Auburn Sr. Activity Center, 808 Ninth St. SE in the Les Gove Community Campus. 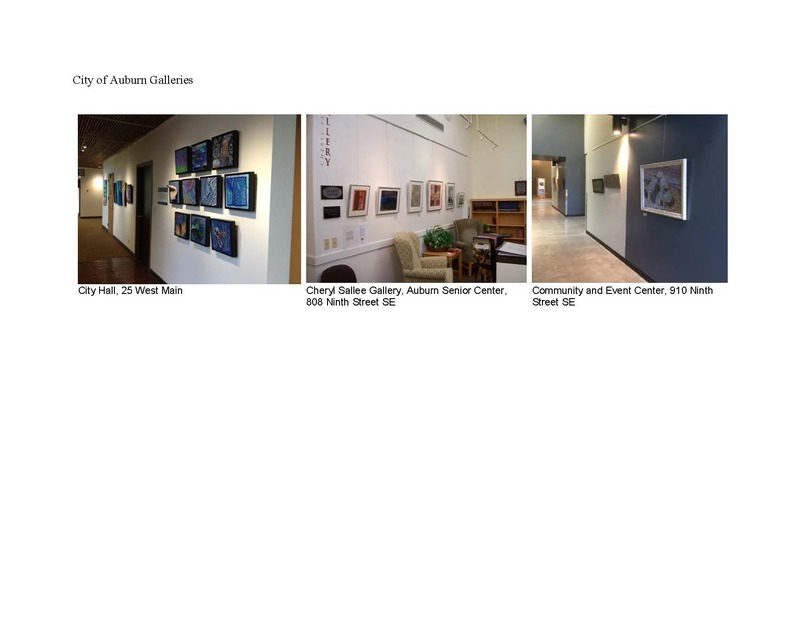 The gallery wall is located just inside the main entrance of the Auburn Senior Activity Center. The Cheryl Sallee Gallery is outfitted with Arakawa hanging system and professional gallery lighting. Exhibits are 8-week solo shows of approximately 8-10 artworks. Hours of operation are 8am - 5pm, Monday - Friday, including various evenings and weekends, based on building rental activity (parties, weddings, banquets, etc). The Community Center gallery is a long hallway within the public area of the active Community and Event Center. Opening in June of 2016, this is a new gallery and is approximately 26 linear feet. The gallery has professional Arakawa hanging system. Exhibits are 4-8-weeks and can be individual or group shows with the space accommodating approximately 15-20 artworks total. Hours of operation: 8am - 9pm, Monday – Friday, 9am – 4 pm Saturday. Professional and emerging artists and/or artist groups working in two-dimensional media will be considered. There is no location restrictions, but all work must be delivered and picked up in person. Artwork via post is not accepted. All work must be mounted or framed and ready to hang with wires. Exhibits are publicized through city-generated press releases, gallery brochure, and the City’s web site at www.auburnwa.gov/arts. Artists may choose to independently produce supplemental publicity and show cards. A reception can be scheduled for exhibit based on artists interest and availability. Artists are required to sign an “Agreement to Exhibit” liability waver. The exhibit spaces are not secured, and there is no insurance for objects submitted for exhibition. Artists may wish to carry their own insurance. Artists are encouraged to offer their works for sale, but are not required to do so. All sales are handled privately between the artist and the buyer. The City of Auburn does not take a commission on any works sold through the galleries. Hours vary. Please reference gallery descriptions above. All city buildings are closed on government holidays. A selection panel of approximately will select artists for all three gallery spaces. The panel includes City of Auburn Arts Commissioners, artists, and community-at-large representatives. Exhibits will be scheduled immediately following the selection of artists. The first available exhibit date is February 2017. Although every effort will be made to accommodate artists’ preferred exhibition dates, we cannot guarantee availability of preferred exhibition dates. The time between exhibitions is predetermined and an installation date and time will be assigned, typically in the mid-morning during the work week. City of Auburn staff will install the artwork and artwork labels. Application deadline: Monday, October 17, 2016. Artists are required to sign an “Agreement to Exhibit” liability waver. The exhibit spaces are not secured, and there is no insurance for objects submitted for exhibition. Artists may wish to carry their own insurance. The artist/artist groups agrees to allow the City of Auburn to reproduce and use submitted images and other submitted materials for the purpose of education, promotion and publicity of the 2017 exhibition programs and the 2017 schedule of events and programs. Submission of your application constitutes agreement to use the artists' materials in this way. Artwork displayed is at the sole discretion of City of Auburn Staff and content deemed not appropriate for public audiences will not be displayed. Up to ten (10) representative images (minimum 3). Preference of work completed in the last two years, and representing the type of work proposed for the exhibition. ¨ Resume detailing exhibition history, and/or an artist’s statement. Timeframe You are encouraged to indicate the months of year that you would prefer to exhibit your work. If there is any month that is not possible for your display, please indicate that as well. Location: Indicate your preference if you wish to show at City Hall Gallery, Cheryl Sallee Gallery (Senior Center), Community and Events Center or no preference.